In Memoriam: William H. Snyder, III, M.D. Dr. William H. Snyder, III, a highly respected and admired professor of surgery at UT Southwestern Medical Center who trained generations of surgeons, passed away Thursday, April 29, 2010, at the age of 73. William H. Snyder, III, M.D.Dr. Snyder joined the UT Southwestern faculty in 1971 and quickly developed a reputation as a highly skilled clinician, gifted surgeon, and inspiring teacher. He specialized in general, thoracic and endocrine surgery with an emphasis on thyroid, parathyroid and adrenal diseases, practicing mainly at Zale Lipshy University Hospital, Parkland Hospital, and St. Paul Hospital. He was especially distinguished by his thorough and compassionate care for each of his patients, offering them his unwavering attention and clinical wisdom. He was instrumental in creating the Department of Surgery's reputation as one of the elite academic surgical departments in the U.S. He established a nationally renowned program in which he and his colleagues pioneered advances in endocrine surgery. Revered by his colleagues, residents, and students, the Laycock-Snyder Teaching Award for surgeon-scholars was created in his honor. In 2006, Dr. Snyder was selected as the Master of the Edward H. Cary College, one of six colleges at UT Southwestern designed to bring together students and faculty to study and emulate the clinical skills, professionalism, and other attributes of a premier physician. He also served on the Faculty Promotions and Tenure Committee for the Department of Surgery, as well as other major hospital and institutional committees. 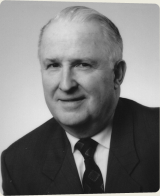 Dr. Snyder was a founding member of the American Association of Endocrine Surgeons and belonged to multiple local, regional and national surgical associations. Always understated and with gentle humility, he was passionately dedicated to the ethical practice of excellent surgery. He was the ultimate surgeon. The son of two physicians, Dr. Snyder was born November 28, 1936, in Hollywood, California. As chief of pediatric surgery at Los Angeles Children's Hospital, his father was one of the nation's first pediatric surgeons. His mother was one of the nation's first female anesthesiologists, which made him a strong advocate for female physicians. Dr. Snyder received his undergraduate degree from Pomona College in Claremont, California, where he was the football team captain and selected all-conference. In 1962, he graduated Alpha Omega Alpha from Baylor College of Medicine in Houston and then served an internship at Philadelphia General Hospital. In 1964-65, he served as a physician in the U.S. Public Health Service on the Navajo Indian Reservation in Crown Point, New Mexico. He then completed his surgical residency at The University of Cincinnati Affiliated Hospitals, where he served as chief resident. In addition to his passion for medicine, Dr. Snyder was a lifelong horseman who delighted in riding the trails of the Colorado Rocky Mountains, where he found renewal, joy and peace. He spent seventy-two summers in Estes Park, where his family has had a vacation home since the 1920s. He was a loving and devoted husband, father, and grandfather, and a loyal friend to many. Dr. Snyder is survived by his wife of forty-nine years, Sandra, son, Ed and his wife Judy, son, Will and his wife Sharon, his grandchildren, Boone, Rett and Marin, his sister Anne Buttner, and his brother Ed Snyder. A memorial service was held on Friday, May 21, 2010 at St. Michaels and All Angels Church in Dallas. To honor his memory, the William Henry Snyder III Fund for Medical Scholars has been established at UT Southwestern Medical Center.